The Snorkel is probably the simplest and cheapest piece of your equipment but it's importance often gets over looked. Some divers use them, some don't, some take them with them, some don't. My advice is simple, take it with you either attached to your mask or in your BCD pocket .. But take it !! As an instructor I wear it on my mask, as a diver I have it in my BCD pocket. Your snorkel should be worn on the LEFT side of your mask, this way you can not make a mistake between regulator and snorkel and it will not get in the way of your hoses. Many snorkels are shaped to come from the left side only. Snorkels make life on the water easy for a diver, if you have ever had a long surface swim or long wait for your pick up boat you will know what I mean. On a calm sunny day I prefer to inflate my BCD, take off my mask, lay on my back and wait but sometimes bad weather and choppy seas prevent this, hence the trusty snorkel. The mouth piece - This must sit comfortable and at the right angle in the mouth to minimise pulling and jaw fatigue. Drain Valve - Some have, some don't. I prefer a drain or purge valve as it makes it easy to keep clear should you get swamped. The Neck - Some are rigid, some are flexible, my choice is flexible as it keeps clear of my regulator, folds better for storage and more comfortable as there is less movement on the mouth piece. The Tube - Normally around 40cm long, large bore tube. Longer than this and you may have difficulty breathing, shorter and it will fill with water. 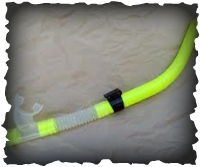 The retaining clip or loop - This attaches the snorkel to your mask, some are clip on and easy to use, others require removing the mask strap to get the snorkel off mask. Clip on is better as it is easy removed for storage of both mask and snorkel. Some divers do not use a retaining device and choose to use the mask strap itself to hold the snorkel. I have done this in the past when a clip was missing or broken but find it uncomfortable after a while. The splash guard - fitted to the end of the tube to help against splashes of water getting down the tube, this is all as it will not seal when submerged. The bottom line is simple as far as scuba diving is concerned. Unless you are intending doing many hours snorkeling the colours, attachments and makes are not important, just make sure you have one.